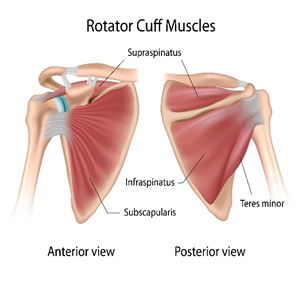 Rotator cuff tears are very common due the physical nature of a lot of jobs and the large range of motion of the shoulder. The good thing is though is that if you have a rotator cuff tear, even a large one, effective physio rehab means surgery isn’t needed. This is when there is a tear in one or more parts of the rotator cuff. It may be a partial tear or can include the full thickness or width of the muscle/tendon. Many studies have been done into the effectiveness of conservative physiotherapy treatment vs surgical intervention for rotator cuff tears, with results showing that conservative treatment can be successful in up to 80% of cases! If you have injured your shoulder, or have been told you have a rotator cuff tear, pop into PhysioSteps today to be assessed by one of our physios. Together we can develop a treatment plan, find the right exercises and hopefully, help you avoid surgery!